Built some time in the 1700s the Dickens Inn was originally a warehouse for either the storing of tea or, it may have been owned by a local brewery. It was only one of a handful of buildings to survive the demolition that took place in the construction of St. Katherine Dock, during the 1820s. 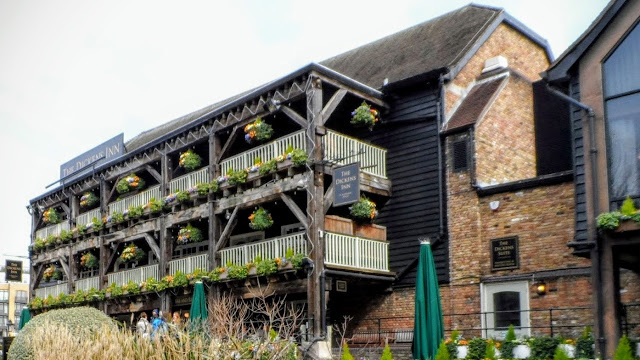 Thomas Telford, the civil engineer responsible for the development of St. Katherine Dock, had the timber-framed building moved 70 feet west, of where it originally stood, to its current site. He then had the 120 tonne timber frame encased in brick, so that it kept in keeping with his vision for the dock. The style of its reconstruction was based on that of the Coaching Inns of the time. All of the warehouses around the east dock, and many surrounding the west dock, were destroyed during The Blitz. During the 1970s a major restoration project began, which saw the construction of many commercial buildings, including the Tower Hotel. In 1976 the grandson of Charles Dickens, Cedric Charles Dickens, officially opened the newly refurbished Dickens Inn. "The most atmospheric spot in the whole of London."